‘Why I Advocate’ is a new series featuring the stories of members in our 50-State Network. The 50-State Network is a grassroots patient advocacy group — with almost 1,300 members across all 50 states and Puerto Rico and growing — that gives patients with chronic illness a voice and platform to tell their stories and effect change in state and federal health care laws and policies. Judy Nagy, from Ohio, has been living with rheumatoid arthritis since she was 25, nearly 40 years ago. She recently became active in the 50-State Network after she retired and found herself wanting to use her newly found free time to help others with arthritis and chronic illness. 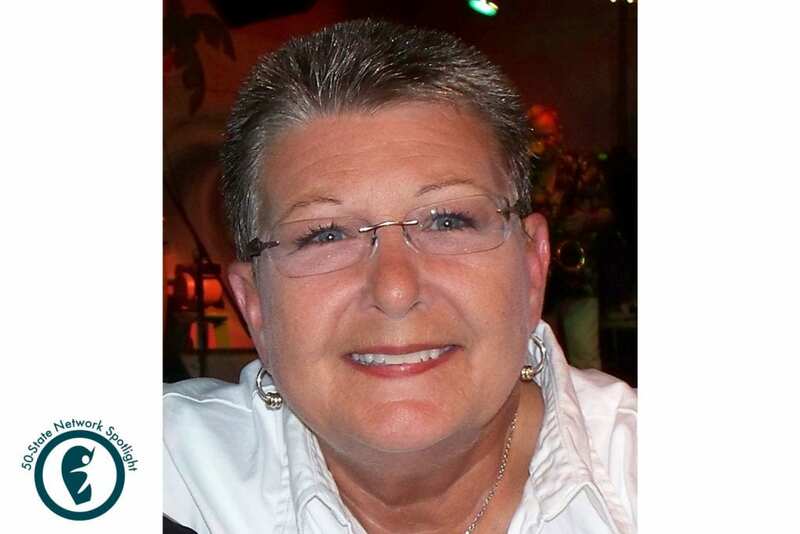 “Having lived with this disease for so many years, and learning so much about testing, treatments, medications, surgeries, insurance problems, and more, I realized that I needed to ‘pay it forward’ as a volunteer patient advocate,” says Judy. 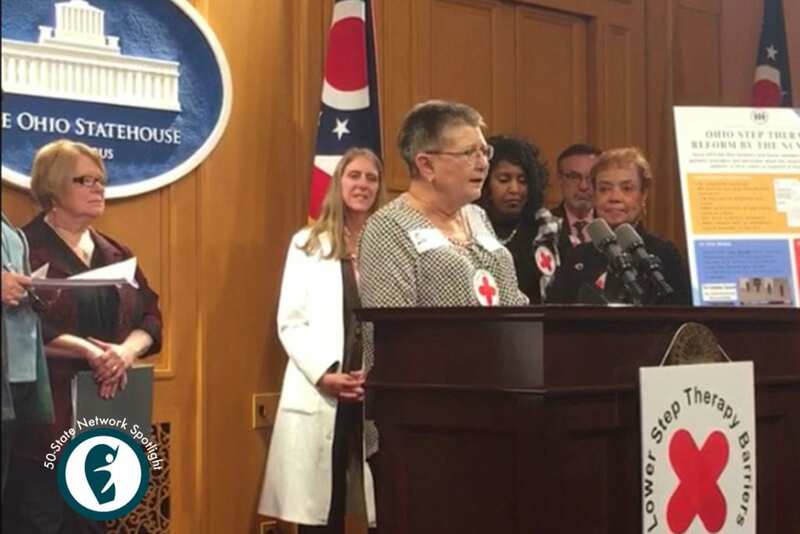 Last year, Judy played a critical role in helping to pass step therapy reform in Ohio after she participated in an advocacy day at the state capitol in November 2018. (Read more about what step therapy is and how it affects patients here.) A few weeks later, Ohio Governor John Kasich signed into law SB265, which adopted patient-friendly requirements related to step therapy protocols implemented by health plan issuers and the Department of Medicaid. Interested in learning more about joining the 50-State Network as a volunteer patient advocate? Get more information here. Tell us about your first experience with RA. How were you diagnosed? Then I started to get a pain in the same arm. The pain radiated from the tip of my middle finger all the way to my elbow. I literally felt like I could go into the kitchen, and get a knife, and cut my arm off above the elbow. That’s how bad it was. It was just excruciating. We went to the emergency room. They did blood tests. They said that I was having an arthritis attack. I’d never heard of such a thing. When we called my family doctor, he said, “I know exactly what it is. I’m calling in a steroid for you.” By the time we got back to Columbus, the prescription was ready. We picked it up, got home, and I took one of the steroid pills. The swelling started going down immediately. It was amazing. My doctor then referred me to the Columbus Arthritis Medical Center. All of the doctors there specialize in rheumatology. It’s a wonderful place. I ended up with a very good doctor. They put me through all kinds of testing. They determined that I had rheumatoid arthritis. What was it like managing RA back then? What was your treatment plan like? I started going to the Columbus Arthritis Medical Center every other week. Then as time went on, the visits were further apart. I tried Plaquenil, but I didn’t really want to stay on it because I was afraid of my eyesight. (I’m legally blind in one eye without prescription lenses.) We just went through trial and error until we found a type of leflunomide that helped. I was actually in remission for a few years on it, but eventually it stopped working. I was on methotrexate for about five years. At some point, my doctor said, “Well, it’s time for us to move onto the biologics.” And now I get an infusion every five weeks. How did RA affect your quality of life? My symptoms were not that bad once I started treatment. I was able to do most of what I needed to do. I was working pretty long hours at the time. I probably overdid it all of the years that I worked. Event planning and trade show coordination required lifting heavy boxes, moving things around, and traveling. It was pretty grueling for a few years, but I felt like I had no choice but to persevere and do my job even if it hurt. I was pretty determined and energetic and I wasn’t gonna let anything get me down. I actually thought that I was going to beat this and it was going to go away some day. I learned over time that it’s not. It’s something that never goes away. My RA just kind of caught up with me when I reached my fifties. I started to feel like I was slowing down and my joints were wearing out. The pain was starting to stay longer. Things were starting to degenerate, and in the last decade or so, I’ve had several surgeries related to arthritis. How did you first get into patient advocacy? I stopped working when I was 60 and I tried to get disability and was denied, so I was struggling. I went through a period of depression. I was on Facebook a lot, and came across different arthritis patient groups, including CreakyJoints. In talking with people in that group, I learned that there are a lot of people out there struggling to find out what to do when they’re newly diagnosed or they’re having a problem with their medications not working, so I started trying to help when I could. What’s it like to speak with legislators about health and policy? Senators and government people, they’re just the same as everyone else. Each legislator or senator that I met with was very warm and welcoming and they listened to our stories. We’re finding more and more that a lot of people, including politicians, have chronic illness or have close family or friends with chronic illness too. I believe that it’s extremely important that our government understands that people with chronic illness have special needs and we have to have a voice to make sure that our needs are met. What do you think it takes to be a good patient advocate? I think it takes someone who is passionate about making a difference in helping people that have chronic illnesses, and being willing to reach out to the community and your peers to make sure that we all have a better life. What advice do you have for patients who are newly diagnosed with RA? Make sure you have a great relationship with your doctor. Many insurance plans will cover getting a second opinion, and it might be useful to help you find a doctor you are comfortable with. Also, find someone to talk to, whether it’s a friend, family member, or someone else with a similar illness. Having a chronic illness can be very depressing because you’re living with something that a lot of people don’t understand. You may not have the ability to explain what you are going through to your family or caregiver. Ask your doctor if they know somebody, or maybe a community group where they can connect with other people that understand what they might be dealing with. What does being a patient advocate mean to you? That I can make a difference by helping people who haven’t lived with arthritis for as many years as I have and gone through the experiences that I have. I feel it’s my mission and my passion to help my fellow peers with chronic illnesses deal with these diseases on a daily basis. Learn more about the health care issues we advocate for in the 50-State Network and how we help patients raise their voice on issues that matter.